8x170 (14x1.5). Thread Pitch: 14x1.5. 8x6.5 (14x1.5). 14x1.5 Ball Seat. 14x1.5 Cone Seat. 14x1.25 Cone Seat. Style: 7 Spline drive close end lug nuts. Truck Spline Lugs. Thread Size: 14mm x 1.5 / 14x1.5 / M14x1.5. - These Lug Nuts can fit any vehicle with studs that are the following thread pitch: 14mm x 1.5 / 14x1.5 / M14x1.5 Threads. Type: Bulge Acorn, Closed End. OEM GM part number 17802466. We can provide a receipt if needed. All HID/xenon parts are sold AS-IS. Thread Pitch: 14mm x 1.5 / 14x1.5 / M14x1.5. 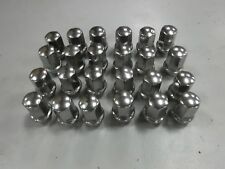 - These Lug Nuts can fit any vehicle with studs that are the following thread pitch: 14mm x 1.5 / 14x1.5 / M14x1.5 Threads. Type: Long, Bulge Acorn, Closed End. Thread Size: 12x1.5 / M12x1.5 / 12mmx1.5. - The compatibility tool is used to match the thread size of the lug nut to the vehicle wheel studs only, it does not match lug nut to the wheel. Lug Nut Torque Specifications: . Great for showing off your wheels and enhancing the overall look of your vehicle.Perfect for replacing rusted and/or broken lug nuts. Made from SCM 435 Through-Hardened steel with a black plating. Heat treated coating prevents oxidation and protects the steel. Description: Condition: 100% Brand New Materials: Made Of High Quality SCM 435 Cold Forged Steel. 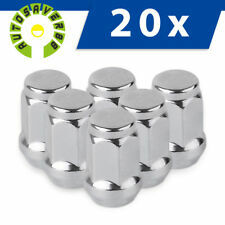 Set of 32 high quality light weight chrome lug nuts. 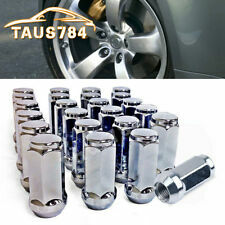 60 degree taper bulge seat lug nuts for secure fit. 2x SPLINE LOCK KEY'S included! 7 SPLINES FOR SAFETY AND SECURITY. Size:14X1.5mm , Tall:2'' inch Item Description: . Thread Pitch: 12x1.5 or 12mmx1.5 or M12x1.5 Threads. Type: Bulge Acorn, Closed End. 60 degree CONICAL bulge seat lug nuts for secure fit. - CHECK YOUR WHEELS = These Cone Seat nuts will only work with wheels that are manufactured with Cone Seat lug holes. Thread Pitch: 14mm x 1.5 / 14x1.5 / M14x1.5. 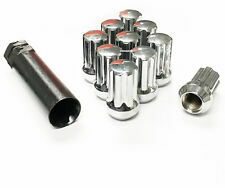 These Lug Nuts can fit any vehicle with studs that are the following thread pitch: 14mm x 1.5 / 14x1.5 / M14x1.5 Threads. Type: Bulge Acorn, Open End. Verify Seat Type = Wheel Lug Holes have a variety of seat types. This is a pre-owned set of GM Accessories Wheel Locks OEM Part # 12498078. Previously used on a 2015 Cadillac ATS. Set is in excellent "Like New" Condition as pictured. This is a set of 24 lugnuts. They will work on 5 and 6 Lug Application. Sorry for the inconvenience! Truck Beds. Exterior Parts. All rates vary for each country due to size and weight. (Sorry No Exceptions!). GM Part #: 9596070. 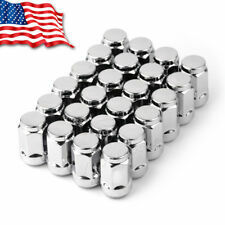 Set of twenty-four(24) Chevy/GMC/Cadillac 14x1.5 polished stainless steel capped lug nuts. Stud Size & Thread Pitch: 14x1.5. These are the genuine GM factory lug nuts used on many Chevy, GMC and Cadillac full size trucks and SUVs. Specifications: 12x1.5 - Closed end bulge acorn style lug nut - 60 degree cone seat - 3/4", 19mm. Fits: Most vehicles with 12x1.5 wheel studs and wheels that utilize a standard size 60 degree conical seat lug nut. Great for showing off your wheels and enhancing the overall look of your vehicle. Perfect for replacing rusted and/or broken lug nuts. Heat treated coating prevents oxidation and protects the steel. CADILLAC DTS 2006-2011. CADILLAC STS 2005-2007. CADILLAC CTS 2003-2007. Set of twenty(20) GM Factory, OEM 12x1.5 Stainless steel capped lug nuts. Not bad at all. Lug Length: 1.72 ”. Lug Wrench Size Required: 19mm or 3/4 ” GM Part #: 9596069. 14x1.5mm CLOSED LUGS - STAINLESS STEEL CAP. 1 UNIT = 20 LUGS. YOUR FACTORY LUG WRENCH SHOULD FIT THESE LUG NUTS PERFECTLY (ORIGINAL GM). THESE LUGS WERE USED ON SET OF 20 FACTORY (OEM) NEW TAKE-OFF GM LUG NUTS. 12x1.5mm CLOSED LUGS - STAINLESS STEEL CAP. YOUR FACTORY LUG WRENCH SHOULD FIT THESE LUG NUTS PERFECTLY (ORIGINAL GM). 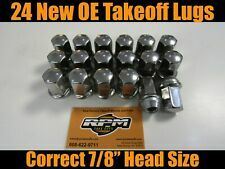 SET (20) FACTORY (OEM) NEW TAKE-OFF GM LUG NUTS - STAINLESS STEEL. THESE LUGS WERE USED ON. 1 3/8" LENGTH 12x1.5mm CLOSED LUGS - STAINLESS STEEL CAP. YOUR FACTORY LUG WRENCH SHOULD FIT THESE LUG NUTS PERFECTLY (ORIGINAL GM). 1 UNIT = 20 LUGS. THESE LUGS WERE USED ON CADILLAC - MANY MODELS. Black Lug Nuts (Cone Seat) - 14x1.5 Threads. Thread Size 14x1.5. These Lug Nuts can fit any vehicle with studs that are the following thread pitch: 14mm x 1.5 / 14x1.5 / M14x1.5. Type Long Spline, Closed End. 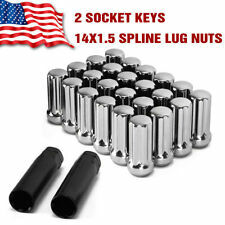 14x1.5 Bulge Acorn Lug Nuts & Locking Lug Set. This lug nut will fit vehicles with 14x1.5 thread studs. Will these lugs fit my vehicle?. The compatibility tool is used to match the thread size of the lug nut to the vehicle wheel studs only, it does not match lug nut to the wheel. 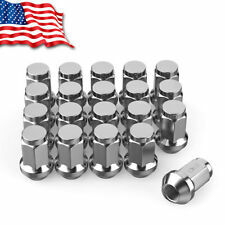 Set of twenty-four(24) Chevy/GMC 14x1.5 Polished Stainless steel capped lug nuts. Stud Size & Thread Pitch: 14x1.5. Chevy Silverado, Suburban, Tahoe, Avalanche, Traverse. Not bad at all. Lug Length: 1.75 ”. Acura ZDX 10-13. Acura MDX 07-13. Bolt Pattern: 5x120. Quantity: 4 Rims. Chevrolet Malibu 13-16. Buick Regal 11-16. Chevrolet Impala 14-16. BMW 530xi Sedan/Wagon 06-07. Part # 12498076. a pretty image. Thread Size: 14mm x 1.5 / 14x1.5 / M14x1.5. - These Lug Nuts can fit any vehicle with studs that are the following thread pitch: 14mm x 1.5 / 14x1.5 / M14x1.5. Type: Long, Bulge Acorn, Closed End. 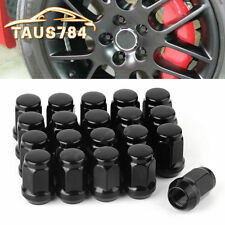 -60 degree CONICAL bulge seat lug nuts for secure fit. Protecting the world's finest wheels and tires from theft since 1964. These easy-to-use, one-piece wheel locks function like regular lug nuts, but require a special key tool for installation and removal. Specification: 12X1.5MM CHROME FORGED STEEL LUG NUTS 24 PC SET 1.9''INCH Package including: 24× Wheel lug nuts Item description: 1,Built to strict quality control standards 2,Ready to use, Direct Replacement 3,Superior quality parts 4,100% Factory tested Fitment: .